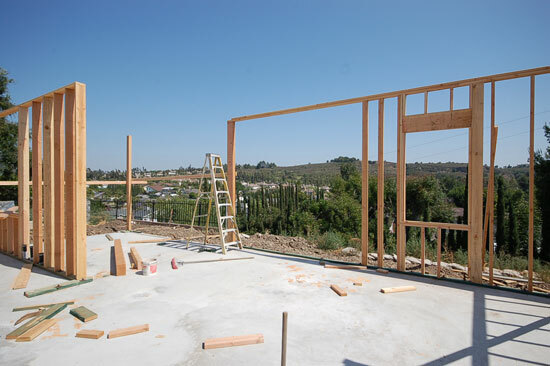 We're here today with a construction progress update for a currently ongoing project- our contemporary single family custom residence in Fullerton, Orange County. After breaking ground a couple months ago, we shared a post on the grading at the site, highlighting images of the newly-poured foundation at this unique lot with great views, maximized by the orientation and layout of the spacious floor plan. With the concrete set and construction moving along, framing began not too long ago, with most, if not all, of the first floor completed at this stage in the process. The photos below were taken several days ago, so we're looking forward to the framing moving upstairs and hope to have further progress updates in the very near future! To view more renderings and floor plans for this open, light-filled design, visit its project page, and read a previous post on Site + Solar for more background information on the site analysis and preliminary design process for this project.